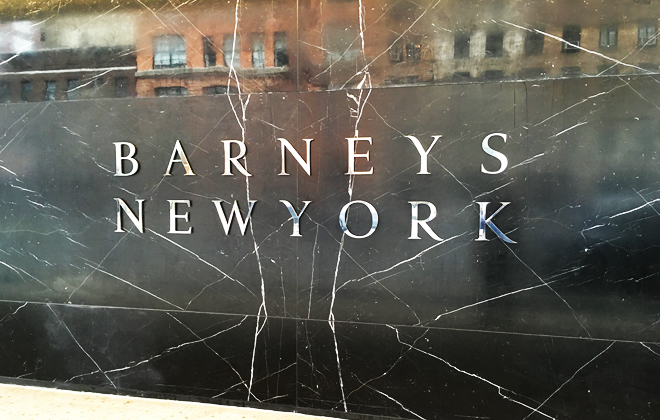 Barneys New York has returned downtown after a hiatus of almost twenty years, and I couldn’t be more thrilled! The Chelsea flagship, which opened its doors last month, is in the same 7th Avenue building as the original Barney’s menswear store that opened in 1923 by Barney Pressman himself. The neighborhood was not a desirable fashion spot then, but throughout the 70’s and 80’s, Pressman’s son Fred saw the bourgeoning downtown fashion scene emerging, and began building the brand to cater to the wild and cutting edge designers whose clothes were beginning to appear around Chelsea. Turned out he had a pretty good idea, didn’t he? Quite visionary. 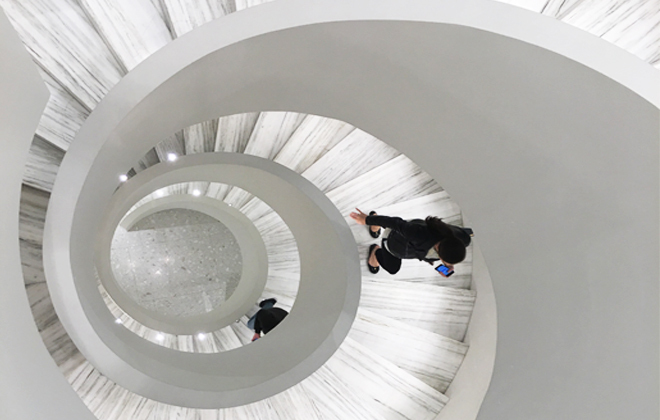 In 1986, the women’s expansion opened, featuring an open-air plan, and loft-like cool throughout seven stories of fashions, with the stunning spiral staircase designed by Andree Putman at its centerpiece. The new flagship, which is designed by Steven Harris Architects with designer Lucien Rees Roberts, attempts to capture the feeling of the original store, while also updating it to fit the contemporary feel of current fashion. 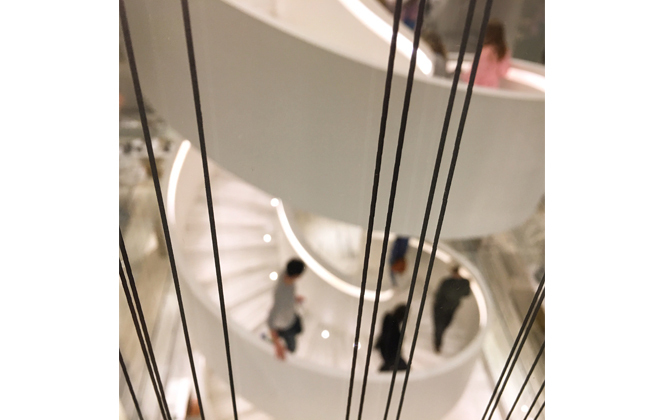 The grand spiral staircase serves as a major nod to the Putman deisgn, but maintains the sleek futuristic look of the rest of the store. Love the marble facade of the store front. Kinda fabulous, isn’t it? All photos by Interior Monologue. View onto the staircase from the top floor glass walls. I just love walking into the 7th Ave space and ascending the stairs to see all the different floors and styles and fashions, with so many exciting new designers, along with my most-obsessed over Valentino picks, I could while away a few hours here quite easily. There is even an outpost of Fred’s, the beloved restaurant from their uptown locale. Although I have yet to eat there to see if their Madison Ave is as good downtown as when I eat it uptown! I love, love, love this staircase. 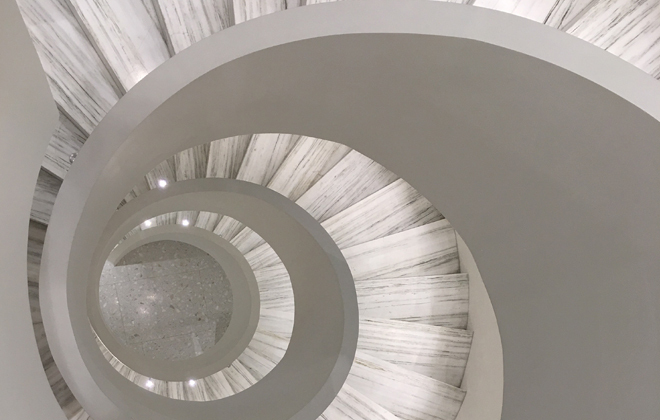 The use of marble for the stairs to create that textured pattern from above is genius. One Madison Avenue salad, please. This fashion stop has come a long way from selling bargain suits off pipe-racks in the 1920s-30. 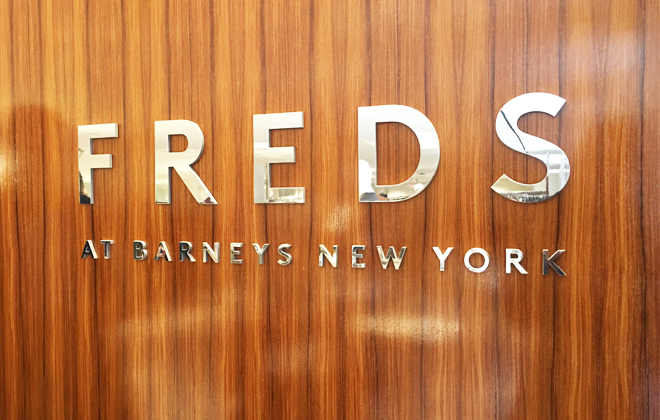 From Fred Pressman’s take over in the 1970s, and re-boot as a luxury brand (complete with Ivan Chermayeff logo), to their expansion in the 80s into women’s wear and haute couture, to their move uptown to the Madison Ave flagship, it’s safe to say they are a brand that has certainly changed with the times. Now, nearing a century old, it finds itself back where it began, fitting in seamlessly in the now totally glammed up Chelsea neighborhood. Welcome home Barneys!